Continuous recording of load and depth during the indentation of three or four sided diamond pyramids. 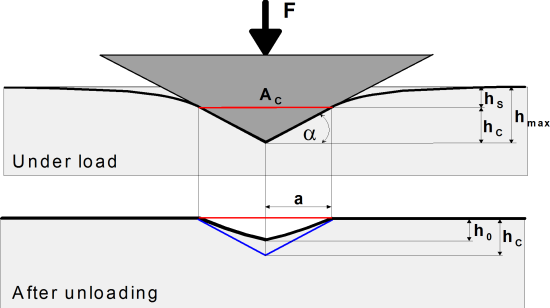 Calculation of the contact area under load by deducting the elastic deformation components and by considering shape deviations of the specimen. 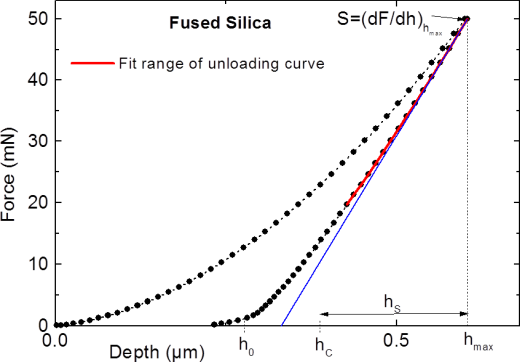 The relation to plastic deformation components only is what distinguishes indentation hardness from Martens hardness. A conversion to Vickers hardness is possible by using the formula HV= 92.62 * HIT. M. F. Doerner, W. D. Nix, J. Mater. Res. 1 (1986) 601. entwickelt. W. C. Oliver, G. M. Pharr, J. Mater. Res. 7 (1992) 1564.